As a resident of Thailand since 2001 reading and finishing a Vincent Calvino crime novel by Christopher G. Moore is akin to being presented with a gift. It comes with no strings or pretty bow attached. I also liken reading a Christopher G. Moore novel to being outdoors, alone, on a nice day as you eat a delicious apple. Some bites snap off perfectly, with great pitch, and meet all your expectations. Once in awhile you spot an imaginary worm-hole that makes you pause. But the experience, overall, remains a satisfying one, especially when you get to the core of the story. Sentence by sentence I enjoyed CRACKDOWN, I read many of them twice. CRACKDOWN is set in post coup Thailand and the insights Moore provides give the reader either an education or affirmation as to what they might know or think they know about life, illusions (and politics) in the Kingdom with a capital K. Moore shines a light on the plentiful black matter found in Bangkok with his signature noir style. 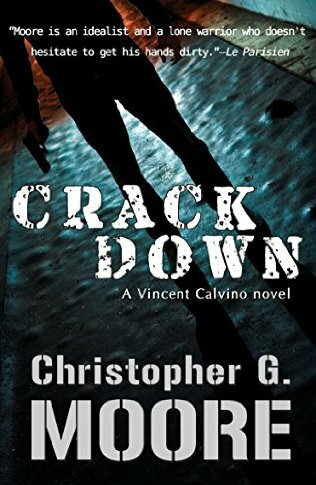 CRACKDOWN is the 15th Vincent Calvino novel written by Moore, featuring the disbarred New York lawyer turned Bangkok P.I. and previously troubled shooter. The book may be considered the third in a trilogy starting with MISSING IN RANGOON and following THE MARRIAGE TREE. Readers who enjoyed one or both of those novels will find added pleasures in CRACKDOWN. Moore takes you on a field trip complete with binoculars. Among the things you’ll see: University political dissidents using Banksy style art to get their message across, the life of an honorable Khmer tattoo artist, an unfinished 9 story condo that transforms itself into its dual role of slum dwelling and tourist attraction with small time thugs on top and big fish aplenty in the basement, Calvino’s white robe wearing, sage advice giving guru, and the behind the scenes attitude adjustment centers where happiness is born. Plus you get to know the lifestyles of high ranking policemen and their HiSo BMW driving wives. There’re more than a few dead bodies laying or floating around to remind you where you are and propel the mystery forward. Technology plays a big role as does information gathering and high level computer science. You also get a retro 1990 re-creation of a computer-less Calvino office complete with his bun-hair wearing, saucy secretary Ratana thrown into the mix, just for a bit of nostalgia and contrast. For meet-ups with his disgruntled side-kick McPhail there’s a hamburger serving black van restaurant with the appetizing name of Road Kill along with an assortment of old Asia hands lamenting about the good old days, which have pased them by. 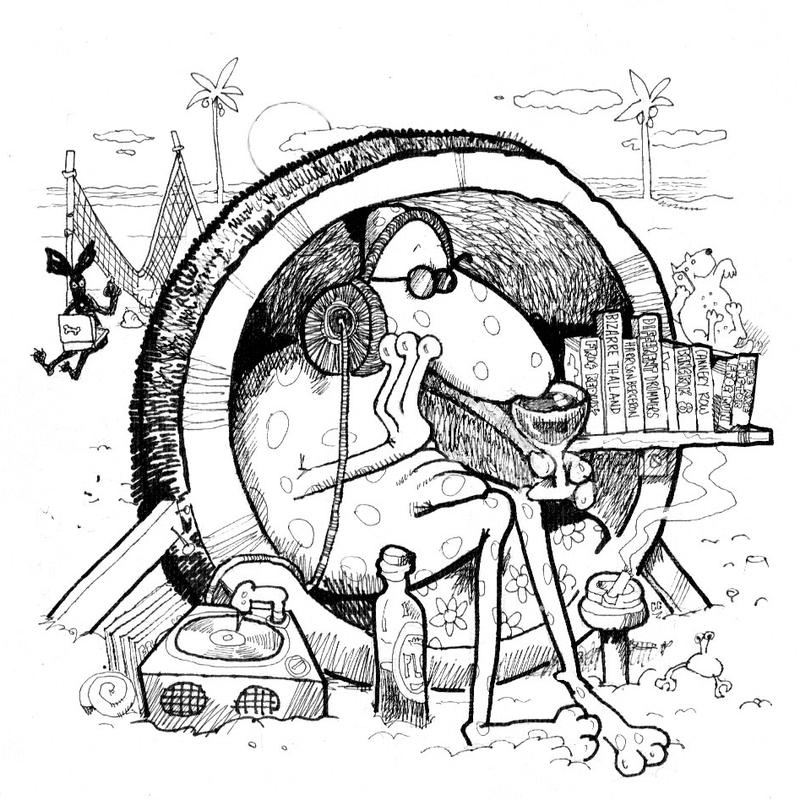 Discussions among the veteran expats include the effects of the internet on the nightlife scene and the creative ways the Chinese use their black vans in Asia. Literary references are wide ranging including, Graham Greene, Joseph Heller, Lucian Freud, George Orwell and Henry Miller. My niggle with the book it is that Moore doesn’t give us enough of Dr. Marley Solberg, the brilliant mathematician and algorithm specialist whom we last saw rocking away with Calvino in the stateroom of a fancy yacht in The Marriage Tree. Her presence is felt but she’s kept off the meandering map most of the time as Calvino navigates this journey solo. Keeping track of all the players involved in the Rohingya trafficking aspects of the novel proved trying for me, at times. It’s a novel Moore would not have written and probably could not have written twenty years ago. All in all I’m glad Vinnie lives to see another sunrise. There are more than enough messages to decipher; it all depends on how you want to unwrap the package. As for any future Christopher G. Moore novels, I’ll read them the same way I live my days: one at a time, with appreciation for all the gifts they include. Nice review Kevin. I will be picking a copy of this up shortly. Bun-hair wearing, saucy secretary Ratana , did you say? I’m intrigued. It sounded good at the time, Trevor. My favorite part of the book. No spoilers but Vinnie finds himself wearing a Hawaiian shirt and a thick gold chain to boot. Thanks for stopping by and leaving your comment. 3/4 the way through and already dreading the end of another great read! Review is right on, and I too find it rewarding to pause and reread a bit to fully savor the depth, good tip! I felt that it would take something monumental to move everyones life forward from the ending of “Marriage Tree” so perhaps Mr Moore has made lemonade from the coup, glad it settled out this way, can barely wait to see where he takes all next! Great to hear from you here, William. Drop by more often. Yes. The coup made for some good material. I had almost forgotten that 200,000 Cambodians made a bee line back to their border. I think that’s one reason Moore writers – to make sure we don’t forget.